I’ve had my eye on this brush for ages but it was sold out whenever I was at a MAC store or counter. The MAC girls did recommend the smudger brush and did say that it works great on Asian eyes, but I had my heart set to this. Oh boy, was I ecstatic when I had finally got my hands on it. 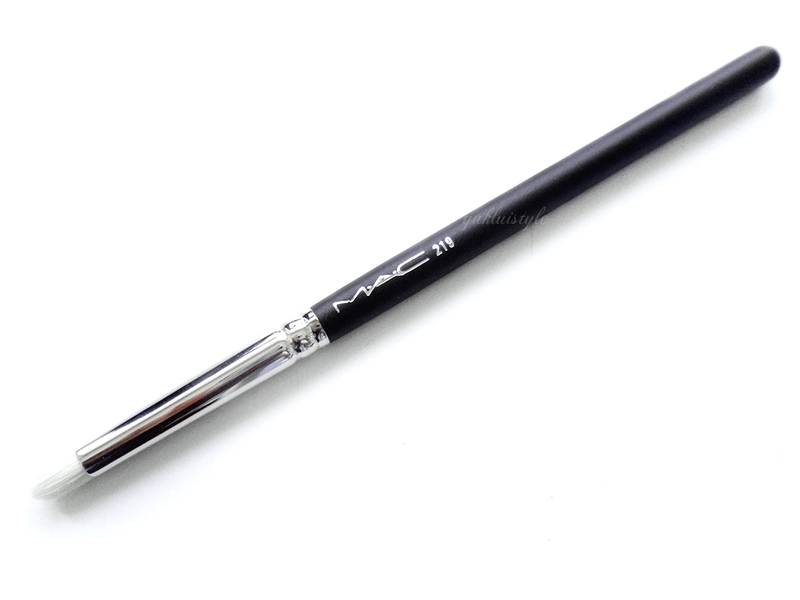 I’ve always loved defining the crease to give my eye some depth and this MAC 219 pencil brush had made my life a lot easier. I’m able to get precision and the correct shape as compared to flat eyeshadow brushes and blending brush. I’ve also used this on the outer V and lower lash line for a smokey eye look. You are able to use this to smudge eyeliner as well. The bristles are made out of white goat hair. It’s not the softest brush I own but it doesn’t irritate the eyes and it’s firm enough to be able to have control. Highly wouldn’t recommend using this on the waterline. The shape is small, rounded with a pointed tip, enabling you fit all areas of the eye. It does pick up a good amount of product, spreads evenly but blending can be an effort on the crease so I always use a different brush to blend out the line. I haven’t noticed any fall out yet. This is the only pencil brush I own nor have any smudged brushes so I cannot compare it to others. I do like this and it definitely is pricey. This isn’t suited for beginners but I always say, practice makes perfect. If you love doing smokey eyes, you will need this. I wouldn’t say it’s a necessity in your collection. Sounds like a great brush, it's so hard to get your hands on the popular MAC ones! Interesting. I'm not very particular about the makeup brush I use, but this sounds like a really good brush. I've always been a HUGE M.A.C fan but I don't use their brushes. This does look like a great brush though. This is my go to brush for the outer v, or for adding an inner corner highlight! Looks like a great brush. I'm going to check this out for my wife. 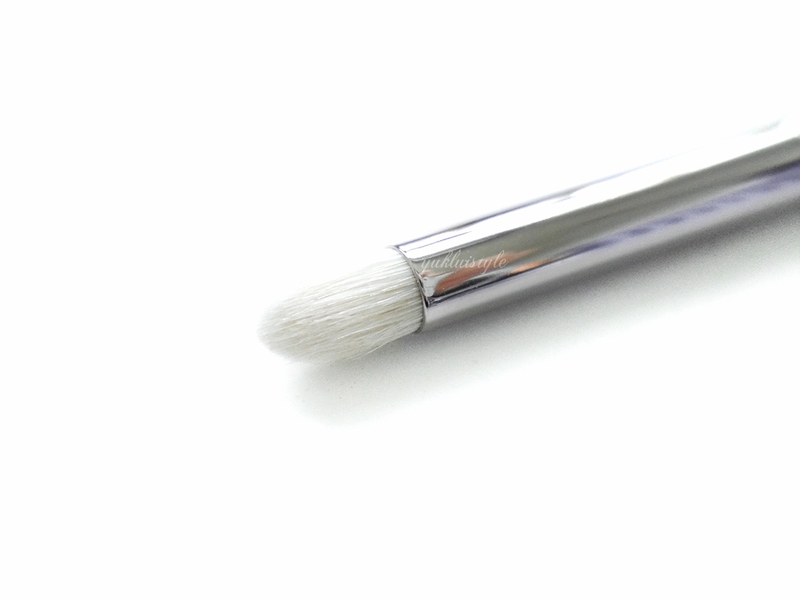 It is an amazing brush, always better for eyeshadows and creases! It has been your dream to get hold of this brush for it makes your life easier. I really like your attitude for this. You're determined to have it and at long last you've got it. Never use any M.A.C bursh before but my friend recommend me to try it too. Thanks for your review. This is great for women and companion for working. Beauty products are women's best friend. A pencil brush lastlonger than the bulkyone. The brushes I buy (even the ones from MAC) all end up abandoned somewhere as I prefer to use the product/applicator directly! But thanks for recommending this brush! Ouch – that is quite expensive. Unfortunately not something I can justify, however I don't tend to wear too much makeup – generall mascara and lipgloss – fab review! Those brushes are seems like good one,will surely recommend them to fellow female friends. Interesting, I didn't know make up brushes were important, I just use whatever on the off chance that I do make up on myself which is rare. When I do decide to take make up seriously, I will definitely take the brushes into account! Thanks! Sounds like a nice pencil brush to try. I'll tell my wife about this and see if she likes to have one. Oh I know what you mean about finally getting something that you've been looking for, especially if it's make-up related. Don't you just love being a girl? Lol. I love Mac products too but I haven't really tried their brushes. I'm happy for you and glad that you finally got you Mac 219 pencil brush, even if it's pricey, it is worth the investment. Great that you waited n finally got your dream brush 🙂 I don't use brushes much or eye makeup. But this brush looks pretty soft n luxurious from the photo.. I've always been too lazy to do much to my eyes, though Iike the shimmery effects a good brush can give. Thanks for sharing your thoughts on this one. frankly speaking i have no idea what a pencil brush is for until you mentioned you use it for the crease, outer v (what's that? ), lower lash line and smudging eyeliner…. i believe mac brushes aren't really on the affordable range? but it's good that you like what you got! I have no idea about brushes like this because my wife hardly uses makeup especially on her eyes. Mac sounds and looks like an expensive brand. Great item for eyes make up!~ Pencil brush sounds like a great choice! Will hop over to MAC boutique when I go to the mall, I have the asian flat eyes hopefully this pencil brush can help to defining the crease. My wife needs to see this, It look like a great product. Sharing this one. I've recently rekindled my love for doing eye makeup, and your post just reminded me how much I wanted this and the 217 brushes! 😀 I still don't have any MAC brushes at the moment since the Real Technique ones I use do the job. But I'll check this brush and the 217 one soon. Thanks for this post!